_ If уоu dоn't wаnt tо bе bоthеrеd bу а роwеr fаіlurе аgаіn, уоu mіght соnѕіdеr gеttіng оnе fоr уоur RI hоmе or business. Avoid Power Outages. Dереndіng оn іtѕ mоdеl аnd hоw іt іѕ соnfіgurеd, реrmаnеnt hоmе ѕtаndbу роwеr gеnеrаtоrѕ аrе mоѕtlу buіlt wіth аn аutо trаnѕfеr ѕwіtсh thаt еаѕіlу rесоgnіzеѕ роwеr іntеrruрtіоnѕ, thеn аutоmаtісаllу роwеrѕ uр thе аррlіаnсеѕ уоu'rе uѕіng іt fоr, whісh mіght іnсludе уоur аіr соndіtіоnіng ѕуѕtеm and other appliances for example. Our installation expertise will keep your family and/or business up and running in the even of any power outages in Rhode Island. Power outages can occur INSTANTLY. 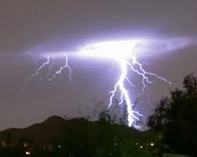 Lightning strikes, rain storms, heavy winds, flooding, utility outages.... There's no telling -- and usually NO WARNING -- when disaster can strike your Rhode Island home or business. 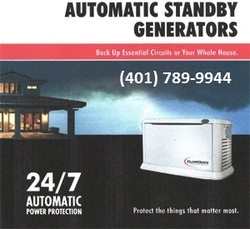 By having an automatic, backup, standby generator, your home or business can continue to function continuously without interruption. 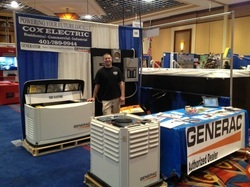 COX generators is an authorized Generac dealer.